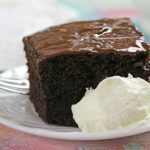 Ultra Moist Chocolate Cake – soft, dark and super moist, the best cake for every chocolate lover! I found this recipe over 10 years ago on a drecipetiquette blog where it was contributed by Noor Hannah. 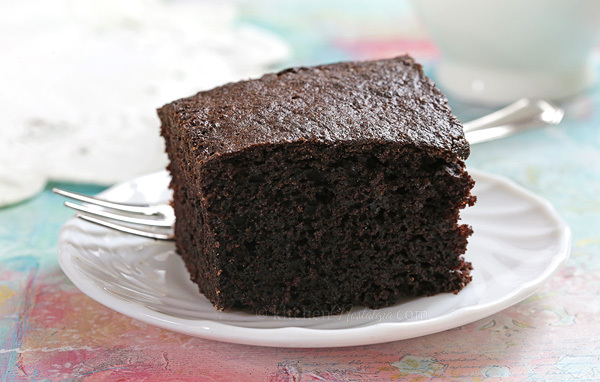 Ever since that time it is my go-to recipe when I want to make a super moist chocolate cake. 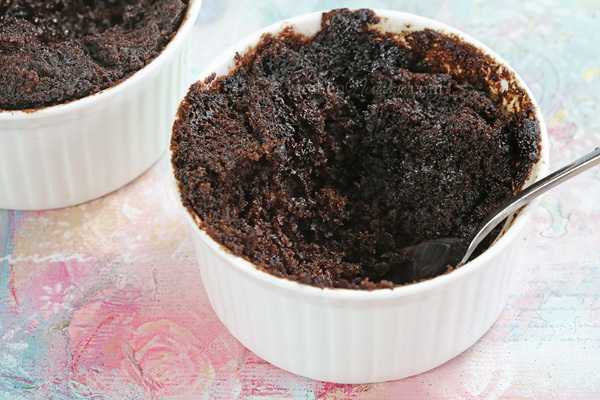 It has rich chocolate flavor coming from cocoa, enhanced with coffee powder. The original recipe also calls for chocolate or coffee or orange or lemon paste/oil which I didn’t have so I just increased amounts of coffee and vanilla flavor. 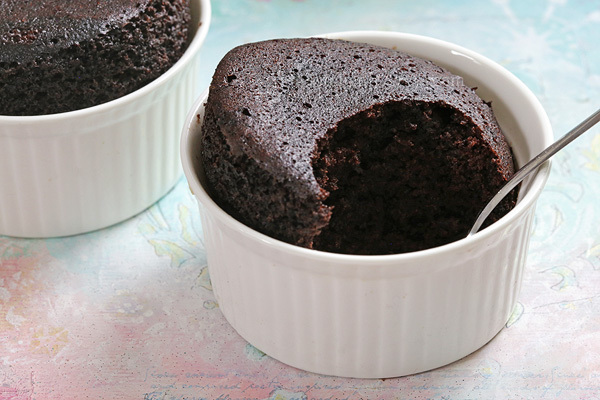 The author says this cake can be either baked or steamed. I tried and liked both versions. 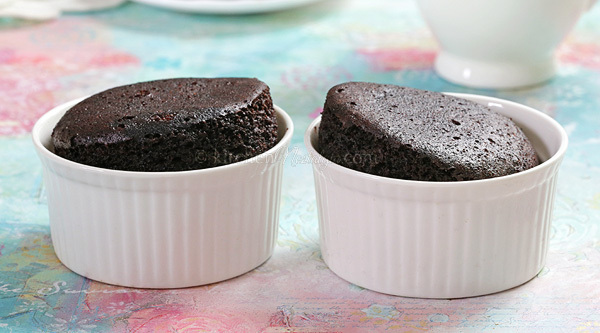 Baked cake is like extra moist, light and airy sponge cake, while steamed one is even softer, fudgy and almost pudding-like. 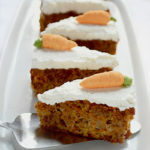 While making the cake for this blog post, I had some mishappening. When I started mixing butter with sugar, my mixer broke down. I tried to mix by hand, but it didn’t turn out as fluffy as it should. This is why the texture of the cake was not as nice as it usually is. This time, instead of baking in 9″ dish as suggested, I baked the cake in 8″ cake tin and used remaining batter to fill two ramekins which I steamed for about 30 minutes to show you what it looks like. I forgot to cover them with aluminum foil, so they turned out more like two little souffles, which I found somehow cute. UPDATE: It bugged me that I forgot to cover ramekins with aluminum foil, so I made the steamed cake again. 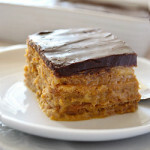 You can see that the texture is different – more like fudge then a sponge. Also, I was asked how to steam a cake, so here is a procedure: take a large pot, put a steaming basket inside (metal colander will work as well), fill it with water up to the bottom edge of the basket (so that water does not touch the cake tin) and bring to boil. 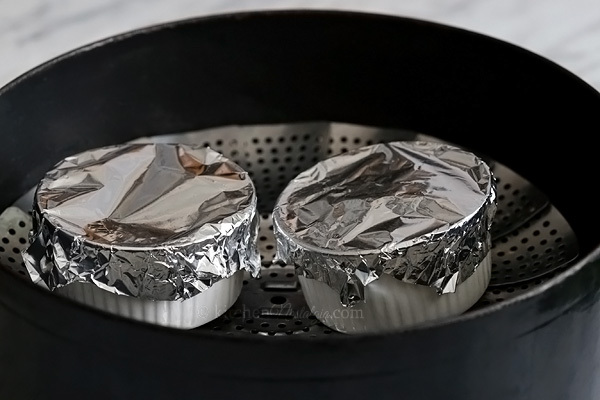 Cover cake tin with aluminum foil, place on the steaming basket and cover the pot with a lid. Cook according to the recipe. 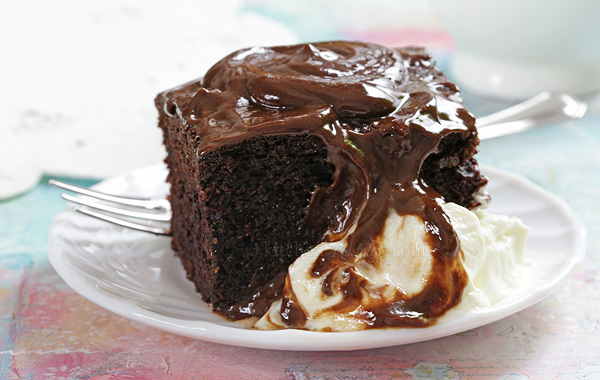 Ultra Moist Chocolate Cake can be eaten as is or it can be frosted with chocolate ganache. I posted the recipe for dark chocolate ganache here and for white chocolate ganache here. Steamed cake doesn’t need any frosting. I served the cake with a dollop of whipped cream. 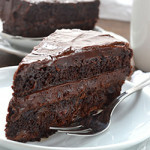 Ultra Moist Chocolate Cake - soft, dark and super moist, the best cake for every chocolate lover! 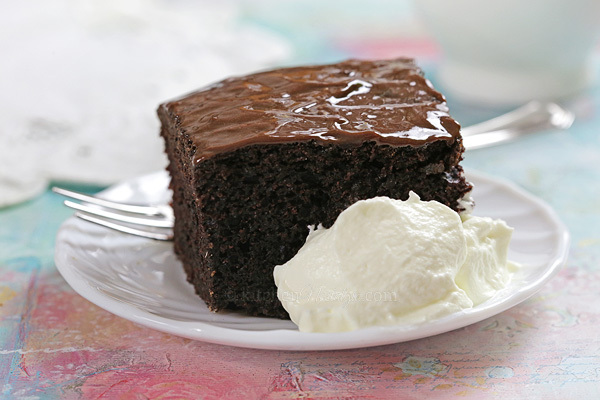 Ultra Moist Chocolate Cake: Mix butter and sugar with electric mixer until pale and fluffy. Add one by one egg, mixing well after each addition. In a small bowl, mix all Ingredients A. Add them to butter and egg mixture mix well. Sift together Ingredients B. Fold them into the batter using a spoon or spatula. Add cold water and stir in slowly until smooth. Pour the cake batter in a greased 9 inch pan. Bake in 170 C (338 F) preheated regular oven for 50 – 60 minutes, or about 45 minutes in a fan oven. You can also steam the cake covered with aluminum foil for 1 1/2 hour. *I say "about" because my measurements differ somewhat from measuring tables one can find on the internet. I measured ingredients in grams, then transferred them to a measuring cups. This is the amount I've got. This cake looks amazing! Love the texture! I’m going to try this. When you say a fan oven, do you mean a convection? I have an electric oven with a fan built in the back. Convection ovens have an exhaust system built in which my oven doesn’t have. I have no idea how to steam a cake. Help !!! 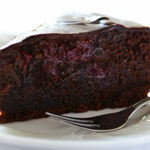 Girls, I have just updated my post with instructions on how to steam a cake. I hope it helps!